Got an MoE in my Chaffee and didn't deserve it! Well, it happened again. I played my Chaffee, which I haven't touched much in months, drove it in a battle with lag so bad I couldn't aim on tanks and my tank moved in jerks, killed one Panzer and spotted 8 tanks. I was killed by enemy arty and finished sixth on my XP team roster. Disgusted with the battle, I went back to my garage and found a star on the gun barrel. What? I know a single MoE is not terribly difficult to get, but mine have been rewarded at the strangest times. The same kind of sequence happened with my KV-1, T67, M4, and 59-16. There are many players much better than I am in all of those tanks, and my results them tanks were inconsistent and unspectacular. The biggest mystery was the M4. I had a miserable record in that tank until one battle where I performed very well (Ace Mastery, 7 kills, etc.). Bing! There was the star. The situation with the 59-16 was similar, though I had more than one good battle. While I can understand MoEs for tanks where I have often had good performances (T-34-85, Rudy, MT-25, T-150, Jumbo, Easy 8, Type T-34, and especially the two on my T-34), at other times, the stars seem to appear randomly. I've been between 91%-94.9% on mine for months. I am a total idiot in mine and screw up most games iplay. It's because you hadn't played it in months - You must have been very close to a mark before you stopped playing it, so when you returned, it still used all of the battles before in the mark calculation. In that time, light tanks were reworked and many average DPG's on the server for light tanks, declined. Thus, your average which was not enough before, became enough after those few months. Mine is two stars, got MOE losing but been highest in EXP n DMG. For some reason bad teams means u get pressed to do more damage even in scouts, but overall i'd got my single and double MOEs with losing teams. I got a mark in a triple zero match in my Ikv 65, it was the biggest wthI had in this game. at least you marked it congrats! Its possible this is his first game in the chaffee since new patch, I know with the new patch certain tanks get a massive MOE boost on their first since said patch. Yes, it was the first since the patch. Maybe that's the reason in the case of the Chaffee. Just odd, because I don't consider myself better than 50% of the player base with the Chaffee or the tanks I listed in the second paragraph of OP above. Exteriox, can you produce a how-to video and post it on YouTube? Common sense? I wish we could get that for gold. Just because you got a MoE, that doesnt mean you did or bad in that tank neccesarily. if ylu got one MoE it just means you did better and got more dmg than 65% of the people playing in that tank in the last week or two weeks. 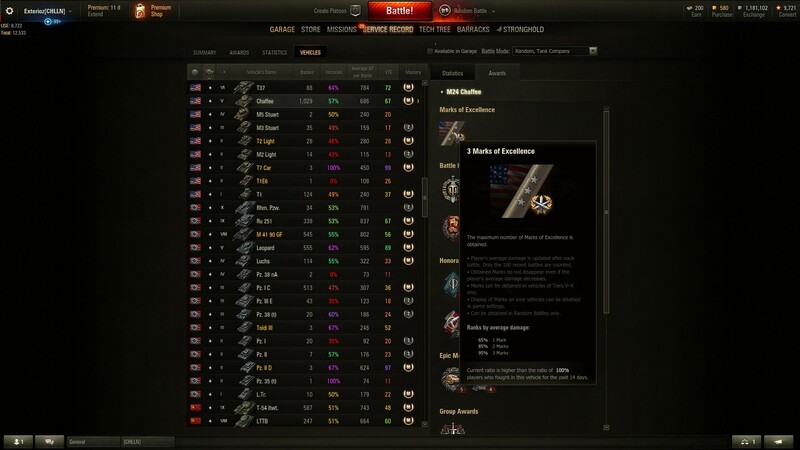 This is also why you see many branches that come out (the swedish, the czechs) with the tanks after T5 with everal marks of excellence, its so easy to get one with new braches and new tanks since no one has really played them. You should watch Circon's Hellcat 3 mark. There's another phenomenon that might be relevant- that the average score expected of the tank changes as time passes. And it doesn't necessarily need to even be the direct result of buffs or nerfs to the tank itself, changes to the maps, mechanics and other aspects of the meta can have an indirect effect on how well the tank performs, and as a result it affects the expected score as well. If you were playing at a level that used to be roughly a 60% MoE score and the expected values drop, you can play exactly the same (or even worse than before) and your score may still rise in relation to your competition. As bad as I a in most tanks in this game, I don't care how I got it; I'm glad it happened. I have 2 first MoE markings on tanks, the Crusader when it was a light tank(that was a surprise), and the Tiger II, which when I was grinding it to get the E-75 only wondered how much longer till it happened. I do no aspire to get these things, as you know, because I am not a great player. This to me just means I know how to get the most out of that tank as far as I can see it. If you haven't been told, It's an overall performance, and the best thing about them is that you keep them even if you drop below the threshold, sorta like a high water mark. Congratulations on getting one in your Chaffee: that one's a keeper. I'm a god-awful Bulldog driver and still have a gunmark somehow . . . It baffles me as well. It shouldn't be possible for 65% of the playerbase to play the Bulldog worse than I do, but I guess it's the case.